What does the Kernersville Police Department have to offer you? Kernersville Police Officers are assigned their own cars, if they live within 12 miles of the town limits, they may drive them to and from work and to off-duty employment. Officers are also granted use of the vehicle for other work related matters such as court, training, or special assignments. Officers who maintain an on-call status are not restricted by mileage. Newly Hired sworn officers are assigned to a patrol platoon upon completion of field training. The standard patrol schedule is in 12 hour shifts as follows: two days on, two days off, and three days on. The on and off days for the following week then switch to two days off, two days on, and three days off. This means in a two week pay period officers will work 7 days for a total of 84 hours. There are times where officers will be required to work more than their normal assigned hours such as court appearance, training, and when the need arises due to man power or emergencies. Employees are compensated for all documented hours worked. 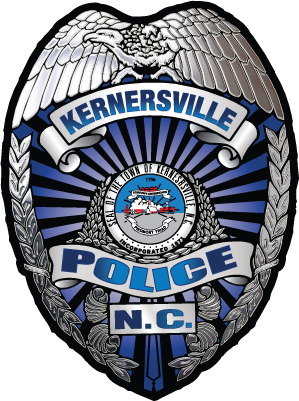 The Kernersville Police Department offers permanent day shift (Approximately 6:00 A.M. to 6:00 P.M.) and permanent night shift (Approximately 6:00 P.M. to 6:00 A.M.) to all newly hired police officers. In order for us to keep the town adequately covered for calls for service some officer’s on and off duty times vary but are generally close to the above times. The Kernersville Police Department offers all the career options found in larger departments, including SWAT, K-9, Traffic Enforcement, School Resource Officer, and more. Kernersville Police Officers are offered competitive pay and an advantageous retirement plan. Pay scales are reviewed annually. Uniforms and equipment are provided.